HWFO November Housekeeping will take place in two sections. First, we’ll unravel a recent study by Nathan Kalmoe and Lilliana Mason, from LSU and the University of Maryland, respectively, that puts some literal numbers to the rise of partisan freakoutery at large. Then if those results sound surprising, we’ll recap some of our culture war analysis pieces that are pertinent to why these things are happening. If you’re a regular reader and looking for new content, check the study and skip the recap. If you’re only here because of the oh so provocative title, you’ll probably want to browse both. In preparation for a presentation at the 2018 American Political Science Association’s Annual Meeting, at the beginning of September of this year, Natah Kalmoe and Lilliana Mason compiled a 41 page study that outlined their findings on American partisan support for violence. 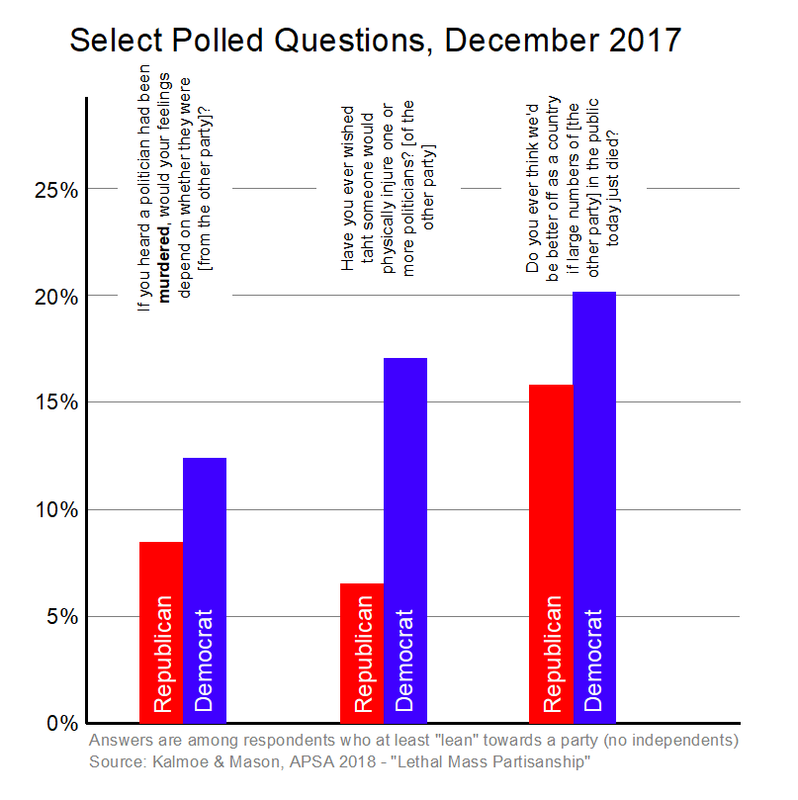 They performed two polls specifically targeting the question of how many partisans support violence, would prefer members of the opposing party died, and such. 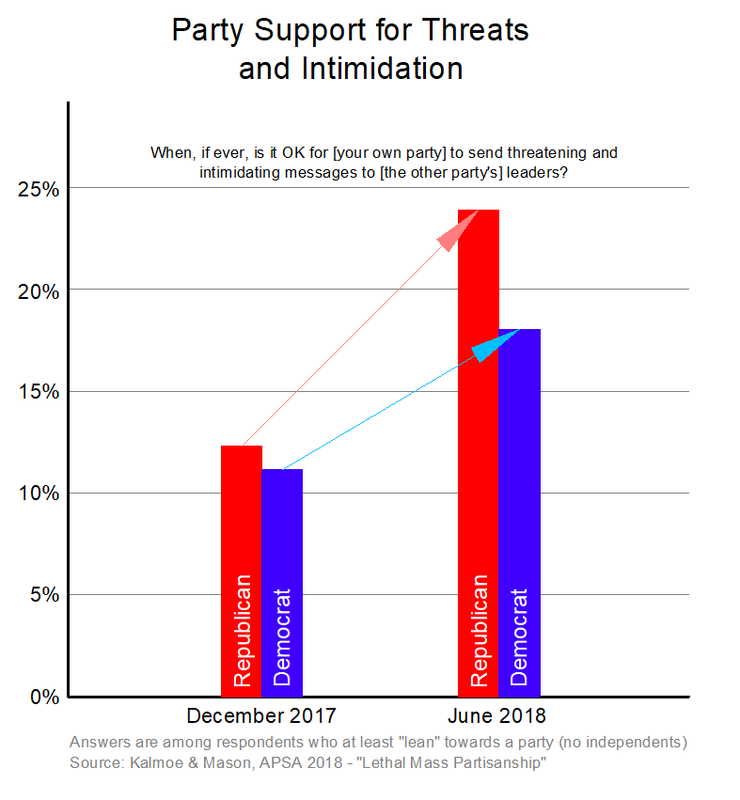 This is fairly groundbreaking research as far as I’m aware, because the topic of “whose party is more violent” crops up a lot in culture war fights, with no real unbiased answer. They appear to have tried to answer this question impartially. They ran two national surveys, one in late 2017 and another in June of 2018. The first one had more questions, but the second one asked some of the same ones, to act as a kind of a time series snapshot. As with all statistical research, you should read through their methodology, which is here. 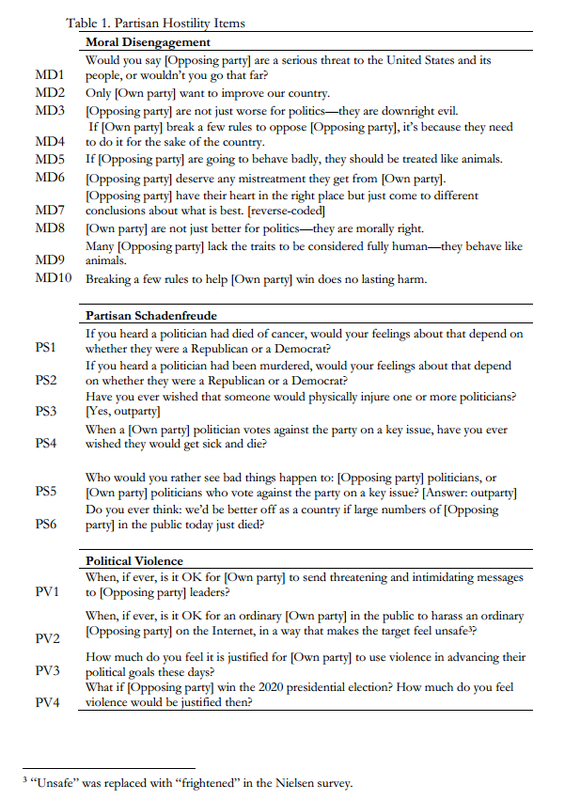 They measured “partisan moral disengagement,” which has to do with how much more moral you think your team is than the other team, “party schadenfreude,” which is how much misfortune (including potentially death) you wish on members of the other party, and “political violence,” which is basically support for terrorism itself. Terrorism: 1 : the unlawful use or threat of violence especially against the state or the public as a politically motivated means of attack or coercion. 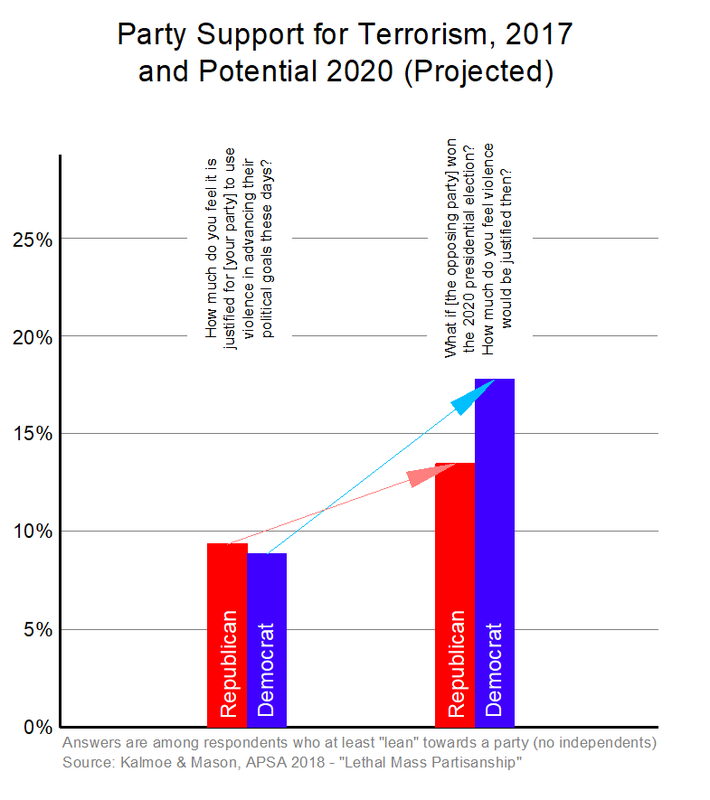 It’s important to note, that the two sample groups for the two polls were independent, so some of the differential between the results of both polls may be due to sampling bias instead of changes in opinion over time. That means I may be cheating a little in one of the graphs below. Fair warning. Because I’m a stickler for clear data representation that doesn’t require cross-referencing and such, I re-cooked some of their graphs. In a perfectly healthy society, all these bars should be at 0%. In a perfectly healthy society, all these bars should be at 0%. In a sick society that’s getting better instead of worse, these bars should be going down, not up. In a perfectly healthy society, all these bars should be at 0%. A healthy society should not project with full knowledge that it intends to get sicker. And there you have it. Doesn’t matter who wins. The beatings will continue until morale improves. Why do we think this is happening? Let’s run through the explanation, by recapping prior pieces which build a case for an explanation. In April 2018, we tied together our series on gun policy with an analysis of our own Medium traffic of the series on gun policy itself. When your entire job is to get clicks, and you’ll starve if you don’t get them, you get those damn clicks any way you can. Which means you find the culture war, wherever it’s happening, and you feed it. You feed it argument fodder. You feed it virtue signals. You feed it whatever it needs to keep warring. The modern media have abandoned measured, reasoned thought, and have shifted to a new job. They are Culture War Arms Dealers. In some ways, we are experiencing a direct result of a kind of pseudo-George Berkeley style subjective idealist epistemology, which goes like this. There is no objective reality, there is only the reality in our minds, which we construct ourselves via sensory stimuli. A sea change in stimuli has transpired over the last two decades, where less of that stimuli comes from the real world, and more of it comes from our glowing screens, be they phones, computers, or television sets. The Glowing Screen Space is saturated by culture war arms dealing clickmongers making us fear things we shouldn’t and milking our anxieties for clickmoney. And we bang away on our keyboards and phones, like rats in a Skinner box. We have built our own Operant Conditioning Chamber. …it should be clear that these sorts of violent boundary cases will multiply as the freakoutery expands. Later in April, we discussed the mathematics of disaster preparation, making the case that people who are worried about wide, large scale violence should consider an overall preparedness plan, which might include owning a rifle. We also pointed out that influential politicians and celebrities are already preparing for this. Do the same math as we did above with the floodplains, in precisely the same way, and we see a 37% chance that any American of average life expectancy will experience at least one nationwide violent revolution. Pretend you’re someone with your eyes on the horizon. What would you be looking for, exactly? Increasing partisanship. Civil disorder. Coup rhetoric. Awidening wealth gap. A further entrenching oligarchy. Dysfunctional governance. The rise of violent extremist ideologies such as Nazism andCommunism. Violent street protests. People marching with masks and dressing like the Italian Blackshirts. Attempts at large scale political assassination. Any one of those might not necessarily be the canary in the coal mine, but all of them in aggregate might be alarming to someone with their eyes on the horizon. And it’s not just tin foil hat equipped right wingers thinking about this stuff. There’s a widely reported trend of Silicon Valley billionaires building apocalypse bunkers, as many as 50% according to Steve Huffman, the guy who founded Reddit. As the media rhetoric around a “second civil war” ramped up towards Spinal Tap Eleven in July, we looked at what some other risk analysis professionals think about the idea. Then we did a little game theory analysis on what a second civil war might look like, and how it might actually be avoided. Spoiler: they’re not following our advice. I claimed a 37% lifetime chance based on raw historical data, and caught flack, but the consensus among those particular risk analysis professionals is around 35% in the next decade. Let’s unpack that incredible figure for a second, with a little mathematics. I derived my 37% lifetime estimate based on an annual chance of 0.59% per year. If their 35% chance per decade estimate is accurate, using the same math (as done before, but backwards), they’d be looking at a 4.3% chance per year. Mr. Mines thinks it’s bigger. According to the consensus among that particular set of experts, the current media and social climate has made a violent revolution against the government 7.3 times more likely than “normal,” on an average annual basis. The Nash Equilibrium here should be obvious. The Blues should play slowly while they’re the authority, and the Reds should give the Blues a little room to roam, but not too much, when they’re the authority, and the opposition side should take what they can get. Any other choice is either an obvious loser or playing with fire. 1. If you’re on the Red Team quit worrying so damn much. You hold all the cards, and by cards we mean guns, and perhaps also tanks, so chill out. Give the Blues enough room to play so things don’t turn violent, but throwing around the brinkmanship card on silly stuff isn’t doing anyone any good, and may risk the “democracy” in general. 2. If you’re on the Blue Team, for Christ’s sake don’t incite violence! Seriously. Antifa is the worst possible thing that could ever happen to the Blues, because they’re risking everything for basically nothing. In short: (again) Chill. Out. Play your cards slowly, please. But that’s clearly not what’s happening, because of the business incentives and feedback loops within the media engine itself, which we laid out in the first article referenced above. Nor can it happen, because of how the media itself is built, into which we dug deeper mid-July. The combination of these signals creates a false picture of the world, which is very close in analogy to the sort of resource scarcity boundary that activates the latent programing to band into violent tribes. You start to think that your life is not as adequate as the ones you read about, that other people have more stuff, that your stuff isn’t enough stuff, and the tiny cluster of resource-scarcity neurons start banging away at your unconscious, infecting your world view. In short, this Tragedy of the Commons scenario with attention spans incentivizes the media corporations to create the exact environment Weinstein holds as predictive for war and genocide. And “incentivize” is too weak a word. They’re required to do this, because if they don’t, some other company will, and the other company will seize their market share. It is a business model recipe for disaster. We’ve built a system that not only can create a violent catastrophe, it must do so. And then as predicted, that system proceeded to try and do so, repeatedly. One of the most shining examples was the Kavanaugh thing, which not only played on our latent tribalism and media addictions, but our very biology itself. There’s no good way out of this. This is Social Disaster Stew Par Excellence, decades if not centuries if not millennia in the making. It would be hard to intentionally create a more divisive situation. You’d need to fly passenger airliners into buildings or something. And now we have Democrats mailing ricin bombs to Republicans, Republicans mailing mock explosives to Democrats, Democrats shooting up Republican campaign offices, and white nationalist loonies who hate Trump and think he’s a shill for Jewish globalists shooting up synagogues. And this is just the midterms.